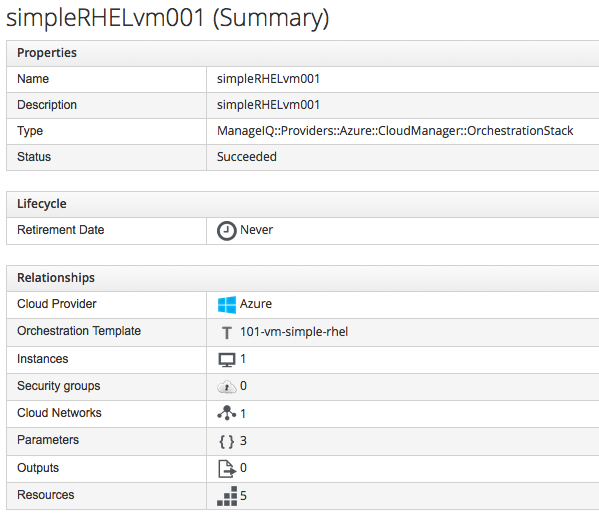 Orchestration templates make deploying complex services much easier in the cloud. CloudForms has supported OpenStack HEAT and Amazon CloudFormation orchestration templates for a while but the CloudForms 4.0 release added Azure (Resource Manager or ARM) as well. Wrapping one up as a service in CloudForms using an off the shelf template is easy and fast, ready for consumption and making use of CloudForms extended automation, like the built in Approval and Quota for example. This GitHub repository Azure/azure-quickstart-templates has a huge number of example templates. 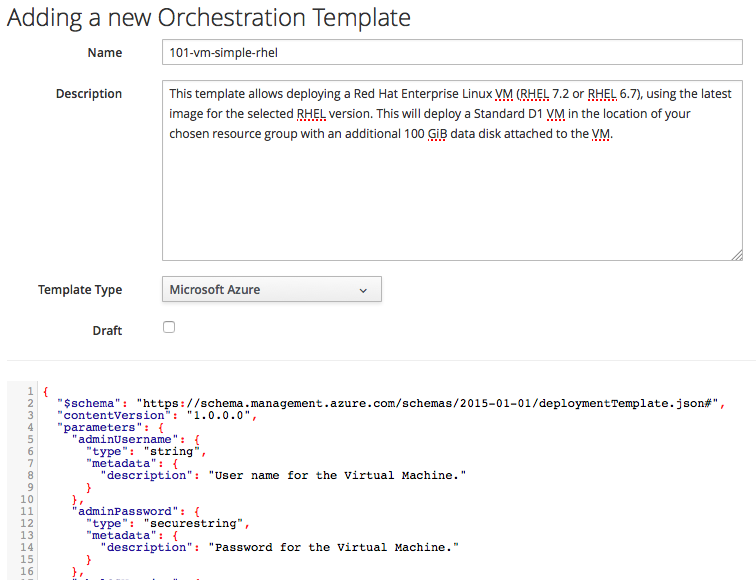 With the recent release of RHEL on the Azure Marketplace, a template has already been added. The Deployment of Red Hat Enterprise Linux VM (RHEL 7.2 or RHEL 6.7) orchestration template deploys a new RHEL 6.7 or 7.2 instance, along with prerequisite resources like network and storage. Watch your Azure subscription burn rate. Now the template has been added, we can dynamically create the service dialogue, with all the necessary elements specified in the parameters header section of the JSON based template. Provide a name for the dialogue and Save. That's it, the service is now ready and can be ordered from Services | Service Catalogs. Monitor the request in the queue. 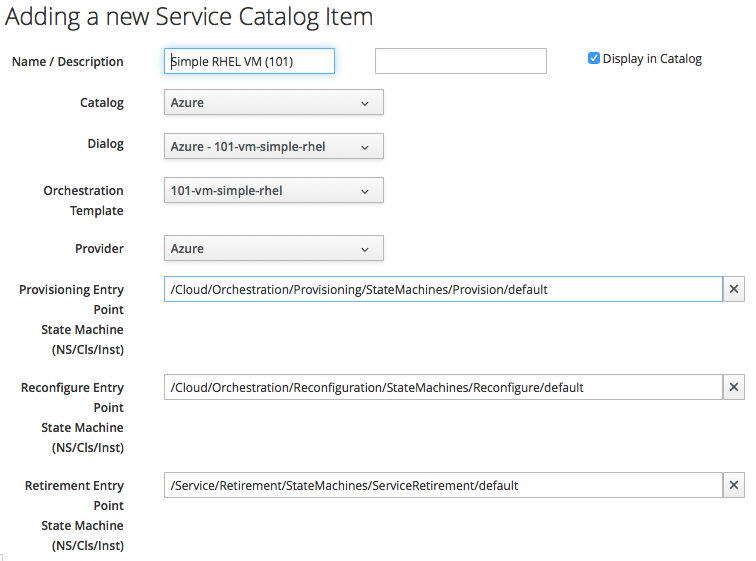 Try Detecting Azure Orchestration Errors with CloudForms to show stack errors in the request Last Message. Select the newly deployed stack in Clouds | Stacks to show the Status and component resources, among other things. 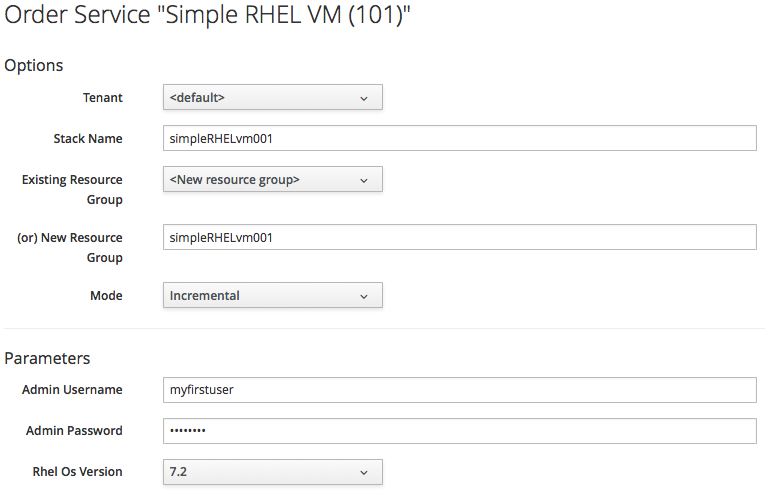 Like the new RHEL VM. 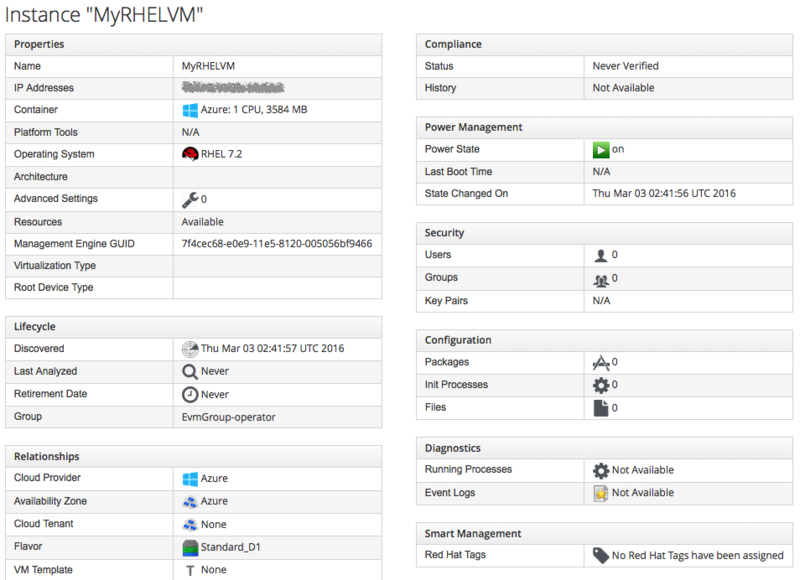 In the Microsoft Azure Portal, view the new Resource Group, containing the RHEL instance and the other deployed resources. For inspiration, there are plenty more examples to try in the GitHub repository Azure/azure-quickstart-templates. In this post, we are going to demonstrate how to create a policy in CloudForms in order to solve the latest vulnerability in sslv2 Please note that this is valid for RHEL 6.